Image courtesy of MCR and Morse Development; Photo: Max Touhey. 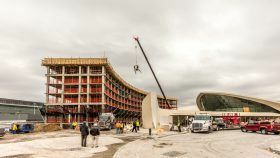 MCR and Morse Development announced this week the topping out of the TWA Hotel at JFK Airport less than a year after breaking ground on the project. 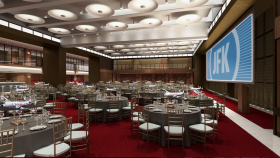 Designed by celebrated 20th-century architect Eero Saarinen in 1962, The hotel is set to reopen in early 2019, when it will become JFK’s only on-airport hotel. 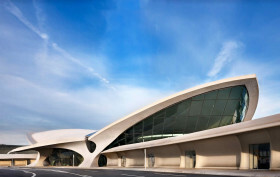 Saarinen’s iconic TWA Flight Center terminal building will serve as the hotel’s lobby; at 200,000 square feet, it is thought to be the world’s largest hotel lobby. 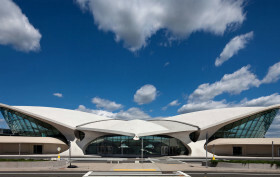 Hotel guests and passengers will be able to access the hotel through the famous Saarinen passenger tubes that connect directly to JFK’s Terminal 5 as well as through via the AirTrain system. MCR Development officially launched the mid-century modern TWA Lounge on the 86th floor of One World Trade Center on Thursday and provided a deeper look into plans to convert Eero Saarinen’s historic TWA flight center at JFK Airport into a hotel, event space, and dining destination (there will even be a bar in a vintage aircraft parked outside). As part of a public-private partnership between MCR and the Port Authority, the project will rehabilitate the landmarked Queens flight center by restoring the majority of its 1960s Jet Age features and adding a crescent-shaped hotel with 505 rooms flanking the original building on each side. According to MCR’s CEO Tyler Morse, construction of the hotel is on schedule; it will go vertical on Monday, top out in December, and have its curtainwall applied by January. 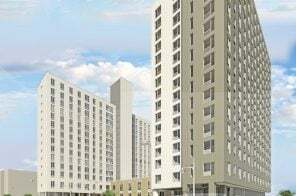 If everything remains on schedule, the project is expected to open in 18 months. The excitement was palpable yesterday evening as New Yorkers packed into the SVA Theatre for a special presentation on one of the city’s most important rehabilitation projects: the redevelopment of Eero Saarinen’s iconic TWA flight center into a hotel. 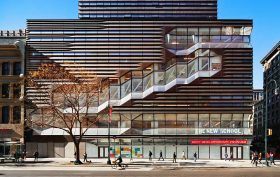 Taking the stage were the development and architecture teams who divulged a slew of new details regarding the design, the hotel’s offer, and even the pricing of the rooms. 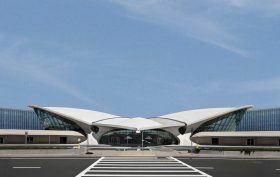 The shovels were out at JFK’s TWA Flight Terminal yesterday, as MCR Development and JetBlue broke ground on their project to turn Eero Saarinen‘s mid-century modern masterpiece into the high-end, 505-room TWA Hotel. 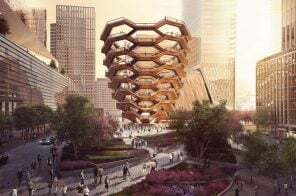 According to a press release, Governor Cuomo attended the festivities, noting that the conversion “will preserve this iconic landmark while cementing JFK’s status as a crown jewel of aviation.” The news also came with two renderings that show the two, six-story, crescent shaped hotel buildings that will rise on either side of the existing structure. The Wright auction house is gearing up for the July 26 auction of kitchen and dining room items from the iconic Four Seasons restaurant. 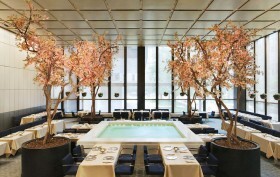 As 6sqft previously reported, news that the restaurant would decamp from the building surfaced last summer, when Seagram Building owner Aby Rosen did not renew the lease for what has been seen as the quintessential Midtown “power lunch” spot for the last decades of the 20th century since it opened in 1959. The restaurant’s interiors feature custom designs by Pritzker Prize-winner Philip Johnson and furniture, tableware and other modernist treasures by the likes of by Seagram Building designer Mies Van der Rohe, Hans J. Wegner and others and custom-made Knoll furniture. With an emotional forward by Vanity Fair editor Graydon Carter, the auction catalog offers a preview of items up for auction with estimates. 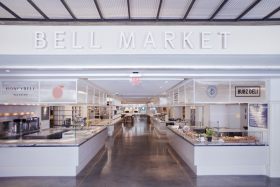 Included will be banquettes designed for the space by Philip Johnson Associates, Eero Saarinen Tulip stools, chairs and tables from the bar of the Grill Room, pans, flatware and dishes created for the restaurant by Ada Louise and L. Garth Huxtable and more.